Editor’s Note: The following is a guest post by Emily Joyce of Fueled. Fueled is a digital product design and development incubator based in New York, Chicago and London. New York City was recently host to the second annual Global Future 2045 International Congress. Organized by Russian entrepreneur and GF2045 founder Dmitry Itskov, the event convened many of the world’s most forward-thinking intellectuals and futurists, dedicated to the creation of a new evolutionary strategy for humanity to overcome the critical challenges of the 21st century. Quietly tucked in between the multiple presentations of the weekend was a short twenty-minute demonstration of a bionic arm. The speaker was introduced with something of a disclaimer: “Please be kind to the next presenter as this would be his first time in a public-speaking role.” No one in the room was prepared for what followed. Nigel Ackland began his talk with a brief history of his condition: an industrial accident about six years ago resulted in the loss of his right arm. Throughout months of surgeries, and with only an awkward hook to replace his hand, Ackland fell into a very dark emotional state. In the prime of his life, this once-avid musician from Royston, Cambridgeshire (UK), was suddenly without motor skills or motivation to move on. You could hear a pin drop as the audience leaned forward to take in the full story of this gentleman. 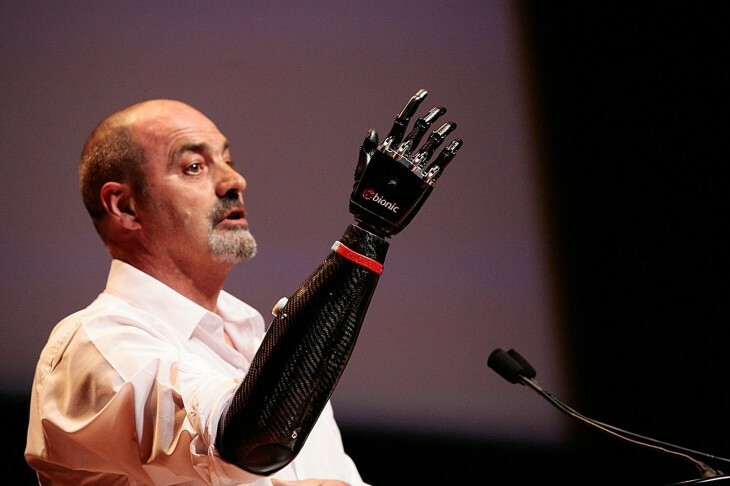 He explained that, earlier last year, his luck took quite a turn when he was asked to participate in a trial for the Bebionic3, a state-of-the-science prosthetic arm developed by RSLSteeper. He described how the device responds to signals from muscles in his arm. As part of the presentation Ackland rotated his wrist a full 360º. The maneuver – as well as the entire presentation — left the audience utterly astonished. Ackland charges the base of the battery-powered bionic arm at night and by morning it’s ready for a full day of service. He explained that the psychological rewards of the arm are extraordinary. Gaining some weight while inactive, his new limb literally lifted him out of his emotional nadir, providing the confidence to return to physical exercise. No longer feeling isolated from and shunned by society, people who were once hesitant to approach him now seek him out to learn of this most remarkable experience. His speech earned a standing ovation. For the remainder of the conference he was swarmed by the curious and amazed, many at a loss for words. But there were also many questions and requests for photo ops. He was a great sport through the whole ordeal as lines formed around him during every break. He tirelessly answered questions with enthusiasm and grace. Most interesting about Ackland’s speech was his focus on the psychological benefits of his new arm and how it allowed him to reclaim his life. The project provided a clear view to the possibilities of the future. For most people technology comes in the form of laptops and iPhones. But technology for Ackland is literally a part of him, helping each day in ways most take for granted. In line with the conference’s theme, Ackland’s arm is a powerful demonstration of how technology is moving forward in ways and speeds that were once the stuff of science fiction. Read next: What's happening with wallet solutions around Northern Europe?